John Beard. Photo credit: Jaime Valdez. John Beard was born in Salem, Oregon in 1940, and, after graduating from Oregon State University in 1964, began a 30 year career as a pharmacist. He now lives outside Portland, Oregon with his wife Lynn, with whom he has studied Native American basketry, its history, materials, design and weaving techniques. John served as vice president of the Native American Art Council of the Portland Art Museum from 2003-2005. It wasn’t until 1983 that John, finally submitting to that inner voice that had been trying to get his attention for years, learned Navajo-style weaving from his mother, Mary Alice, who a few years earlier had also taught his father, Ray, to weave. Visits to Arizona and travel on the Navajo Reservation afforded him first-hand knowledge and greater appreciation of this weaving tradition and its infinite variation in design. Although his first weavings followed conventional Navajo designs, he soon began blending the Navajo weaving technique with NW coast Indian basketry designs. From 1986 to 1999, he wove exclusively with his mother’s hand spun, hand dyed, blended wool yarn. 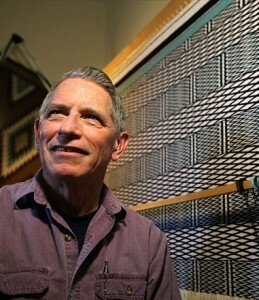 His Navajo style weavings have been accepted and displayed at juried shows and galleries in Oregon, Washington and Alaska. In July 1994, just a month after retiring, John took his first class in Ravenstail weaving from Cheryl Samuel. Additional classes honed his weaving skills, and in 1996 he guided a group of Cheryl’s Portland area students in the weaving of a full size Ravenstail robe. After its completion in 1998, and building on that additional experience, he continued to weave, completing a full size robe, a youth robe, two small child’s robes, an apron, and several smaller pieces over the next eight years. A special highlight of his exhilarating weaving journey has been the opportunity to see the robes worn and danced by Native Americans at Celebration 2000, 2002, and 2006 in Juneau. Sharing the story of Ravenstail weaving through teaching, demonstrations and presentations continues to be one of the most enjoyable experiences of his life.